solo exhibition at Flashpoint Gallery, Washington, D.C.
Mending is an interactive installation that explores meditation and mending as art medium, metaphor, and practice. Contemplative environments positioned throughout the gallery invite audiences to sit or stand in meditation with sculptures and paintings constructed from ordinary materials associated with mending. 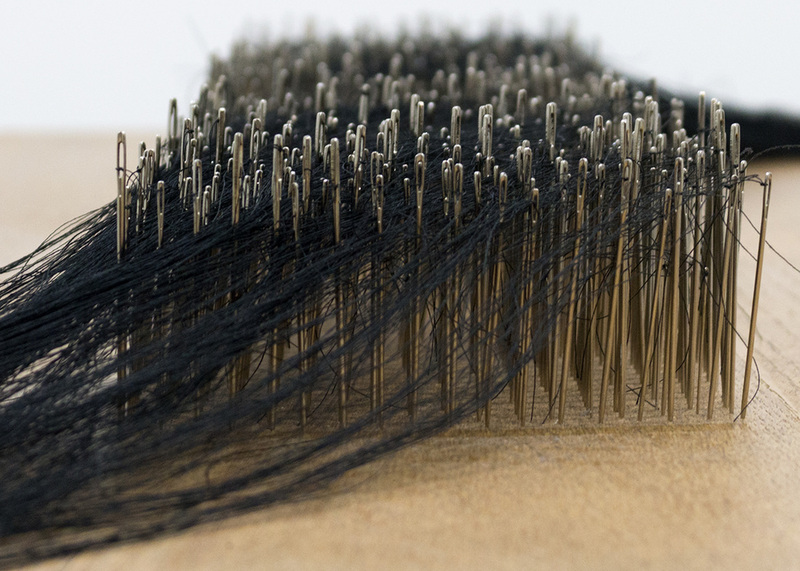 Thousands of threaded needles, tangled sculptural masses of thread, and stitching offer opportunities for reflection on the work of reparation. My interdisciplinary approach begins with an investigation into the poetics of materiality and the desire to create public and private engagements as a way for the viewer to embody metaphor. By drawing attention to the art of mindfulness practice and to the act of threading a single needle, Mending encourages us to contemplate the stitch-by-stitch process that may lead to transformations in our lives and in the world.